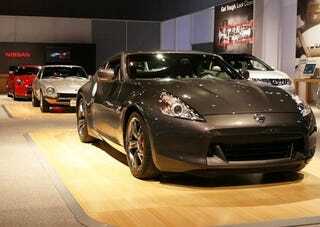 The Nissan 370Z 40th Anniversary Edition has bowed on the floor of the Chicago Auto Show accompanied by the fabulous Datsun 240Z. Also, the Nissan GT-R tagged along and asked if it could join the cool kids club. The 40th Anniversary 370Z is unique only in paint and plaques, with a fancy dark gray paint job, powder coated wheels, red brake calipers, red seats and red contrasting stitching. Let's be honest here, the real star of this particular floor showmanship is the absolutely perfect Datsun it commemorates.